Blue Diamond is an exclusive boutique hotel in Pretoria that offers a hidden world of luxurious peace and tranquillity within the environs of Moreleta Park. 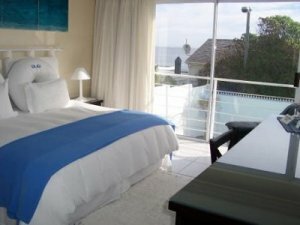 Blue Horizon Guest House, Gordons Bay is set against the backdrop of the majestic Hottentots Holland Mountains and surrounded by spectacular views. Ideally situated on the Blouberg Beach, it's the perfect holiday destination for families and couples alike. This ocean property features four luxury bedrooms as well as shared amenities including a large lounge area, open plan kitchen and dining area, ocean balcony and outdoor swimming pool. Escape to a hidden sanctuary, unwind and rest in our beautiful rooms, revitalise and breathe in the sunshine, drink in the views and enjoy our warm hospitality. This Bethal guesthouse will become your preferred accommodation on your way to Swaziland, St. Lucia and the North Coast. The Bluewaters Hotel is a place to switch off, relax and soak in the beautiful views and sights. Blyde Canyon, a Forever Resort has commanding views of the Blyde River Canyon, the third largest canyon in the world. Bo Kouga Mountain Retreat provides the ideal getaway for peace and quiet, from the chaos of modern city living. Bolton Hotel is an elegant 5-star hotel located in the Wellington central business district. The three star, stylish BON Hotel Bloemfontein Central is centrally located – ideal for the overnight traveler or business executive. BON Hotel Skakopmund caters for sport groups and the leisure, corporate and conference markets requiring the best Swakopmund accommodation. Bonnievale River Lodge offers stylish, self catering or bed and breakfast accommodation in the heart of the Robertson Wine Valley. We pride ourselves in providing comfortable rooms in a tranquil environment. This unique 3-star hotel offers rooms aboard a boat located on the River IJ at the NDSM Wharf in Amsterdam. If you are seeking peace, tranquility in a unique and different surrounding then the Boulders Beach Lodge is the hideaway that you are looking for. The majestic house with its large wrap-around veranda is the ideal place to come and relax after a busy day exploring the wonderful Overberg region. Within easy sight, sound and reach of the beach, this is the perfect place to escape the rat race. The British Colonial Hilton Nassau hotel is the perfect union of colonial elegance and contemporary style. A home away from home with a warm ambiance and affordable rates. Budmarsh offers five-star accommodation, dining and conference facilities in a charming country setting a short distance from the historic town of Magaliesburg.